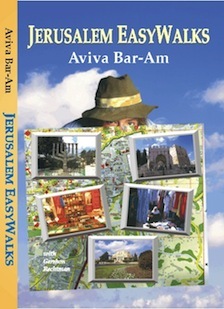 Jerusalem EasyWalks is an exceptional guide to a magical city. Brimming with well-researched historical material and laced with anecdotes, folk tales and legends, Jerusalem EasyWalks leads readers through enchanting old neighborhoods along with major municipal attractions. With Jerusalem EasyWalks you will explore the Jewish Quarter’s synagogues, museums and momentous finds, venture into David’s City, , move through the labyrinths of the market neighborhoods, roam the Temple Mount and stop at the city’s most spectacular viewpoints. Written in a conversational style that is both factual and absorbing, Jerusalem EasyWalks makes fascinating reading even if you don’t have plans to visit Israel. Shmuel's guidance was fantastic. He brought the rich history of the many places that we visited to life, and took us to places that we would never have visited on our own. We will recommend your services enthusiastically to anyone planning a trip to Israel.